Diary TESS&ELLA We are in Jordan and yesterday we went to the Dead Sea. I swam really far out and I was floating. There were loads of salt crystals and Nye made a salt crystal palace. There have been loads of camels around. This is one of my first diary entries. 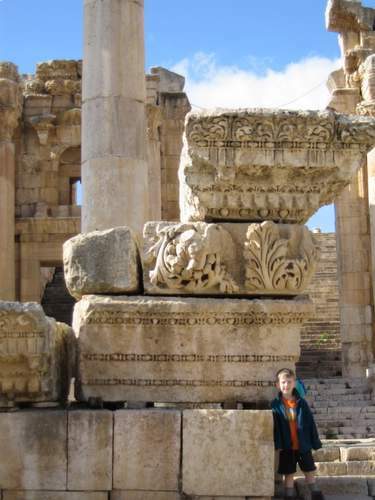 We went to Jerash and I always love the theatres as they lots of secret tunnels leading to the seats and stage. I have done a little bit of work but hardly anything but today we did lessons and Ella has taught me loads. I have had a great day of fun lessons. I am a bit sick of the same thing for breakfast all the time – boiled eggs, pitta bread, strong olives, apricot jam and tea that I don’t really mind but I miss hot chocolate. I had some today at the internet café. I was sick in Aleppo, Syria. We have seen so many Roman ruins, my favourites were Ephesus and Palmyra mainly because of the camel ride. Hama in Syria was quite nice but at the gigantic wooden wheels that scoop water out of the river there were two upside down dead ducks in the shallow bit and their brothers and sisters were quite happily playing around them. I have watched a bit of news. The Syrians really love their president and they have pictures of him everywhere! I spent New Year in Turkey in like a mini house with a swimming pool. It is starting to warm up. I had better go. Tess & Ella.